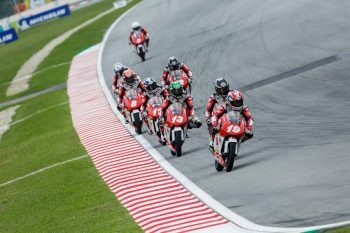 While selection for the 2019 Idemitsu Asia Talent Cup was announced last month, a provisional entry list has now been provided along with the calendar for next year’s championship. Six countries are represented on the provisional entry list including Japan, Thailand, Malaysia, Turkey, Australia and Indonesia. Seven of the youthful talents who rode in the cup last season will return, with 14 new faces joining them on the grid. Amongst the provisional grid are Australians Harrison Voight, Jacob Roulstone, and Luke Power, who was initially named as a reserve although has now secured a position in the academy. The first race weekend of the year sees the cup racing alongside MotoGP at the grand prix of Qatar from the 8-10 March, and the season begins with a back-to-back bang as the series then heads for Buriram in Thailand the weekend after. The next date is the cup’s first visit to Sepang International Circuit as they race as part of the Malaysian Superbike Championship from the 14-16 June, and then there’s a summer break before the second half of the season kicks off at Buriram alongside MotoGP from the 4-6 October. The cup then heads for the Twin Ring Motegi in Japan two weeks later, before the season finale once again takes place at Sepang and another exciting season concludes in early November. In 2018, the title fight when down to the wire between Haruki Noguchi and Australian Billy van Eerde, the Aussie ultimately coming out on top after thrilling finale.